Press Man Coverage is our Twitter Poll winner at http://twitter.com/footballinfo for this week. I’ll look at some of the myths and reality of coaching Press Coverage. We’ll also talk about technique for coaching press coverage to your athletes. I used to be one of those guys who shied away from press technique. Always thought you had to have some kind of freakish athlete to do it. Now I’m going to share with you why that’s just not true. 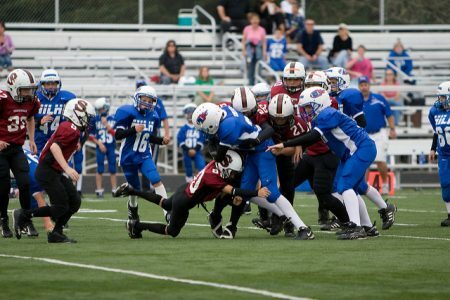 Why you can use press coverage for your football team, even with average athletes. This episode is brought to you by The 4-2-5 Defense System at http://425defense.com. Visit there to get all the details on this complete Coaching System, including how to put together a coverage package that matches your defensive front. Whether you’re going to run Cover 3, Cover 1, Quarters, Robber, or Split Field Coverages, The 4-2-5 Defense System gives you complete instruction on how to do it. Plus you get base run fits, change-up fronts, blitz package, game planning, practice planning and more. Everything you need to dominate on defense this season with The 4-2-5 Defense System. I’ve worked with over 1,000 coaches on installing the System around the country and around the world. At every level including High School, Middle School, Youth, College, and Semi-Pro. Check out http://425defense.com for all the details on The 4-2-5 Defense System and how you can get instant access, today.